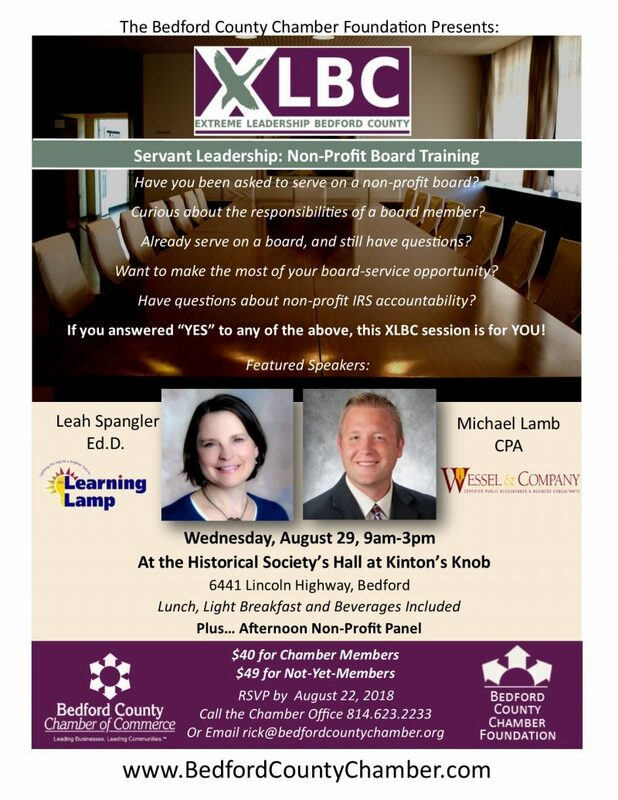 The Bedford County Chamber Foundation is pleased to offer non-profit board training as part of the ongoiig Extreme Leadership Bedford County (XLBC) offerings: Wednesday, August 29th beginning at 9am at the Historical Society’s Hall at Kinton’s Knob. This valuable educational program is available to all (one does not need to be a graduate of Leadership Bedford County or a member of the Chamber to participate.) Anyone who serves on a board can benefit: non-profits, churches, service organizations, etc. Leah Spangler, DE of the Learning Lamp will provide an overview of the responsibilities of board service, in partnership with Michael Lamp, CPA of Wessel Company. The day will also feature a panel discussion with long-service community leaders from several local boards. Networking, light breakfast, beverage service and catered lunch will also be part of this enlightening day. For more information or to RSVP, call Rick Smith at the Chamber office: 623-2233 or Click here to register.